HomeHawk Smart Home Monitoring HD Camera System, 1 Front Door HD Camera and Wireless Access Point Base. 100 Years of Panasonic consumer product confidence is built into the HomeHawk home monitoring experience. Installs easily with no electrical wires or networks cables needed because it runs on battery power and works using our home Wi-fi network****. 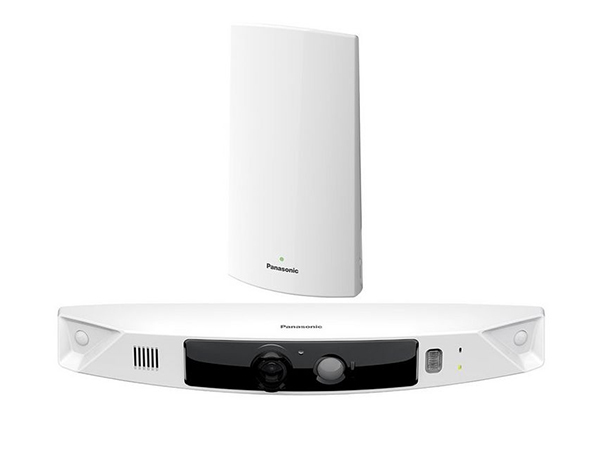 Panasonic Wi-Fi and rechargeable battery power means the cameras are fully wire-free. Set alert zones to minimize unwanted alerts, while still having the option to record video alerts to a secure Micro SD Card** in the systems wireless access point base unit, no 3rd party monitoring or cloud services are required. HomeHawk cameras offer HD video quality and are weather-resistant,*** plus they run on Panasonic’s built-in long-life rechargeable battery* technology that powers many of the worlds most advanced automotive and electronic devices. No more black and white low-quality network video, monitor your home or apartments front door with Panasonic’s color night vision technology. Color night vision is the difference between seeing and knowing what or who arrived at your front door day or night. Add up to 16 peripheral HomeHawk weather-resistant* outdoor HD cameras. Enjoy the confidence and convenience of the Panasonic HomeHawk App. Simple, Effective, Secure. • Color super wide view – 172-degree front door camera fully covers front door top to bottom and porch left to right in full-color day or night with color night vision. • Activity zones – set custom motion zone alerts and view stored video from the HomeHawk app. Store videos to the wireless base unit’s Micro SD card, no cloud service required. Card sold separately.